Royal Worcester Values porcelain china Vase Saucer Plates Dish Jug Cup Pot Bowl Figurine Ewer Teapot Dinner Service Tureen Plaque Platter Tea Service Mug Coffee Service Jardinière Sugar Bowl Tankard Tea Set Urn. 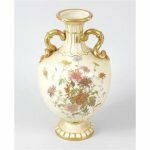 A Royal Worcester china vase of baluster form, the gilt finished twin carry handles modelled as serpents, the ivory blush coloured ground decorated with flowers, printed marks to underside and numbered 1430. 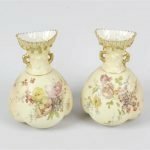 A pair of late Victorian Royal Worcester blush ivory vases, each of lobed bulbous form, having flared and knopped twin handled neck, decorated with flowers upon a blush ivory ground, with gilt detail, each with marks to base. 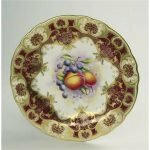 Royal Worcester plate signed T. Nutt, painted with fallen fruit within a gadrooned gilt border, black printed marks to base. 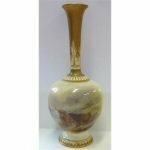 Royal Worcester Harry Stinton vase, painted with highland cattle signed, serial no H169, 18.5cm. 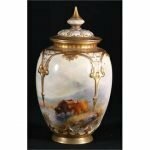 A fine Royal Worcester porcelain Vase hand painted with a scene of Highland cattle and signed H. Stinton, shape number 1661 and date code for 1920. 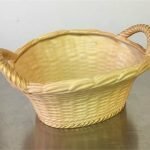 An early 20th Century large Royal Worcester blush ware twin handle basket. 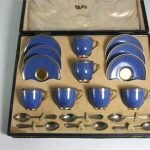 Boxed set of 6 Royal Worcester Coffee Cups and Saucers with Silver Spoons. 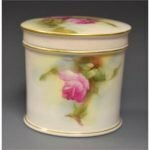 A Royal Worcester Hadley Ware, jardiniere, decorated with roses back and front. Date code 1904. Height 20cm, Diameter 24cm. 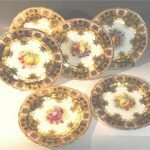 A set of six Royal Worcester plates depicting groups of fruit, signed by H. Price. Date Code 1949. A Royal Worcester hand painted rose patterned vase and cover, signed M.Hunt with puce back stamp. 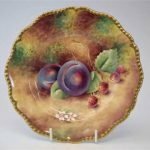 Royal Worcester maroon and gilt decorated cabinet plate with hand painted fruit scene to centre by ‘R. Lewis’. 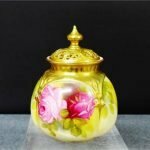 A Royal Worcester cylindrical trinket jar and cover, painted with pink cabbage roses, gilt line rims, 8cm diam, printed crown and circle mark, date code for 1912. 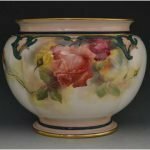 Antique Royal Worcester Porcelain Values Online Valuations Authentication & Appraisals Prices – How much is it worth?